Siouxland Gutter Helmet is a family owned and operated business that has been serving Sioux City, IA and the surrounding areas for over 15 years. Owned by Robert Scott, the company is the area’s exclusive dealer for Gutter Helmet. Serving the Sioux City Tri-State area—including parts of Nebraska, Iowa and South Dakota—has driven us to become a true leader in our industry. We’re committed to giving homeowners throughout our service area real peace of mind 24 hours a day, 7 days a week, 365 days a year. This is why we offer a full suite of services designed to give your home the best possible protection against the elements. We’re proud to be an authorized dealer for Gutter Helmet, the brand that has been America’s #1 choice in gutter protection for over 30 years. Our gutter guards feature a patented nose-forward design that keeps leaves, twigs, and nesting animals out, effectively preventing clogs and expensive water damage. 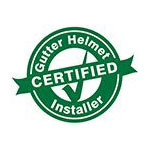 Partnering with Gutter Helmet allows us to give our customers the full benefits of top-quality products along with factory-trained installers and strong warranties. Besides Gutter Helmet installation, we also specialize in seamless gutters, roofing, replacement windows and doors, vinyl siding, insulation, sunrooms and SunShade Retractable Awnings. Our crew understands the value of professional installation and works hard to give you a 100% hassle-free customer experience. Call us at (800) 824-3772 today for free quote or fill out our online form to schedule an on-site consultation. Our Gutter Helmet experts will be happy to assist you.